The ferry has just set sail across the strait. Outside, all is steely water and grey fog. We're heading home after a wonderful long weekend on the mainland. Friday was spent with my parents in Chilliwack. My mother and I did a little crafting and a lot of talking. Dad and Tim went vehicle shopping - just looking. In the evening, my brother and his wife came over for one of my Mom's wonderful meals. Saturday morning found us driving into Vancouver to visit Ashley and Owen. They rely on public transit or Car-to-Go for their transport, and were happy to take us up on the offer of a ride to Ikea where we did a little shopping and returned to their suite with a tree strapped to the top of the car. In the evening, we took the Sky Train and bus downtown to the Vancouver Christmas Market. Last year, Owen and Ashley enjoyed the markets in Berlin, this year, a little flavour of Germany came to Vancouver. There are many small booths filled with delicate ornaments, toys and delectable food items. Several of the booths are staffed by German citizens who come to Canada for a few weeks in December. Delicate ornaments, wooden toys, and plenty of lights made for a visual feast. We sampled the gluhwein, shared a dish of raclette, and a cone of roasted chestnuts. The week awaits. But the memory of the weekend will stay for a long time. Joining Mary at the Little Red House for Mosaic Monday. Sounds like a lovely weekend for sure. I'll have to venture up to Vancouver next Christmas season to experience something more international. Next Sunday I'll be in Chilliwack! How lovely to spend time together with your family enjoying the German market, we always loved heading into Munich to sample those same delicacies at the Chriskindlmarkt, when we lived in Bavaria. What a wonderful weekend you had visiting with family and friends. The market sounds wonderful, sure wish there was something like that out our way. We could have almost run into each other and never known... I had to think quick which night we were in IKEA last week. Not the same night. Sounds like your trip across the water was worth every moment. Sounds like a weekend well spent. Hope your week is just as good! You had a wonderful weekend. And your mom sets a pretty table with a delicious looking salad. I miss my mother's cooking. I wonder if we have been where the Christmas market is. Is it that regular big market along the water? It sounds like you made the most of your time on the mainland. We so enjoyed that German Christmas market last year. I remember Judy's post from that Christmas Market and thought I might get there this year, but it was not to be. A weekend visiting the generations on either side of you must have been a treat - your happiness comes through. It's nice having the big city so close and yet far enough away. We enjoy visiting Vancouver too and I'm sure it's just beautiful "over there" with it's Holiday decorations. It's great though to come back home to the Island and slow down just a wee bit, isn't it? Well, that sounds like a wonderful weekend! I don't know of "car-to-go" but I admire your kids for going it with no car to depend on. That really wouldn't be possible here in our rural area but I think it would be hard for me anywhere. Hi Lorrie, definitely sounded like a weeekend to remember. 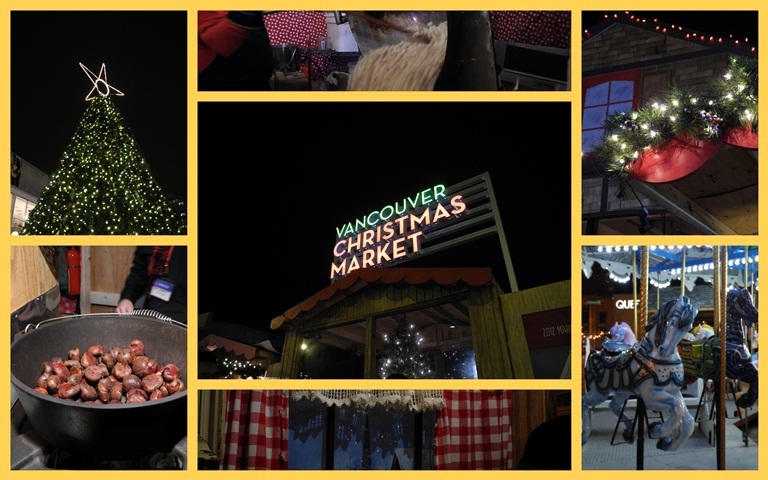 Thank you so much for taking the time to visit the Vancouver Christmas Market, and taking such wonderful photos. We really appreciate your visit, especially since it involved a bit of travel. I hope you and your wonderful parents have an amazing holiday season this year. Sounds like a fun trip and the sea looks calm.